It must be every drinker's dream and it has now become a reality, at least if you believe the manufacturer. Keep young and beautiful by drinking beer - that is what Bavarian entrepreneur Helmut Fricher is promising. Anti-ageing beer was presented to the world at a German agricultural fair this week - a drink which the brewer says will bring body and soul into harmony. 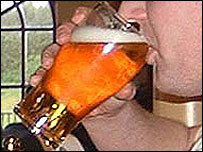 But the new wonder drink may fall foul of Germany's oldest valid law, the Beer Purity Regulation. The anti-ageing beer that Mr Fricher presented to the Green Week trade fair in Berlin is supposed to help strengthen the immune system and make you feel good in a way that other beers just do not. It is brewed in the normal way, but then key ingredients are added. There is spirulina algae, which, as the German version of Men's Health magazine notes, is well known to health fanatics as an extra source of minerals. Another key element is the protein flavonoid, which is supposed to work against cancer. But this great hope for health-conscious beer lovers has encountered a legal problem. The Reinheitsgebot, the world's oldest valid law, dating from 1516, states strictly that beer can contain only four ingredients: hops, barley, yeast and water. A court hearing in the next few days is likely to order Mr Fricher to rename the product.